Hi all - I've been using PSu for a few weeks now, and the more I use it, the more brilliant I think it is! Of course, it's not perfect, but it does so much more than all the other DAM software I've tried that I'm liking it more and more. I'm gradually importing all of my digital photos into the database and all is going well. However, I have quite a few scanned transparencies (slides) and of course the dates are messed up because they take the date of the scan. With some of these slides I'm not even sure when the originals were taken (some go back to the 1970s and even before that) so the best I could do is to guess an approximate year. I'm really interested to know how others deal with this (surely I can't be the only one) and having altered the exif date, whether I would need to re-import. Actually I'm at the first of them so if there was a utility (Mac) to edit exif I could change the date before import, which would be much better. Any and all advice very welcome! 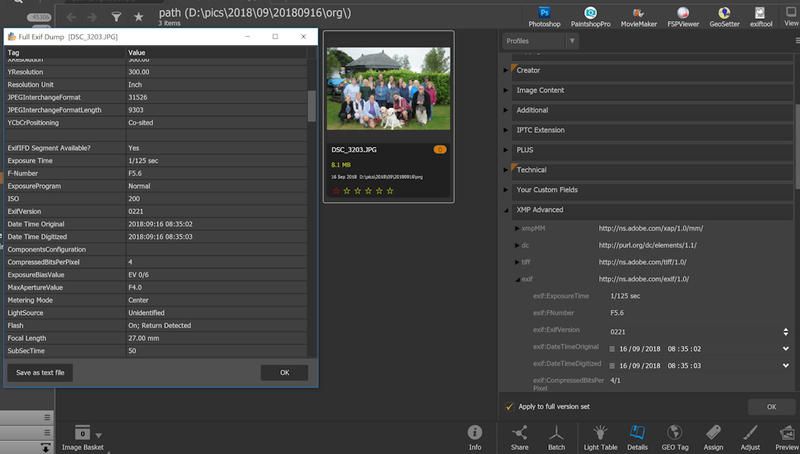 Have you looked at altering the EXIF data from the Detail panel ? I have altered the Digitized data by 1 second and then compared it with an EXIF dump. I think I misread this when you first posted as I read the first bit and assumed the issue you were asking about was the philoshopical (?) one of what date to give the images, but if the question is about how to redate, then right click > redate gives multiple options - hope this helps! I have scanned many thousands of slides and as said the photo-date will originally be set to the date when they were scanned. This is for sure never correct. This gives me the challenge of how to find the correct date and what to do if the date isn't known. The time is never known and of less interest. On some occasions I add a time mainly to be able to add a sequence on slides for a specific day. Otherwise I always set the time to 00:00:00. Date for most of my slides are more or less known. I may know the year and month or at least maybe only the year or maybe nothing. I start by deciding a year and I either know or guess. To this I add a month. Again, either I know or I guess. Same for day. The motive will tell me things. If it is snow then is is in the winter and I may go for January. If people are swimming it may be summer then I go for July and so on. If this is a birthday the month and date should be rather easy to figure out. There have been slides where I could determine a year by counting candles on a cake. When adding a date it is not possible to say "approximately" or "in between", there has to be a date with Year and Month and Day. When I started of with my slides (some 10 years ago) I adopted a date which is my not-known-date. Based on the simple assumption that you can always guess a year all I do is add April 27 to this year. So a slide from 1947 with unknown date is dated as 1947-04-27. If I see people skiing in the photo I adjust the date to 1947-01-27. Interesting food for thought there Harald, thanks. I need to do a load of scanning at some point, and in the past never found a very good method. I think this time I may use something based on your method, and perhaps also a set of labels to indicate the precision. E.g. "year estimated", "month estimated", "day/date estimated"; or maybe I'll frame it as an accuracy setting, something like "date accurate to decade"/year/quarter/month/week/day. I'll give it some thought! Thank you Harald for taking the time explaining your time line description. Thanks so much Harald! That's really great information! Now the only thing I need help with is how to file the scans (because with me everything is currently filed in date order by folder (yyyy/mm). Having changed the date, do I need to export and re-import the scan in order for it to be filed in date order? Thanks again! Glad to be of help.Again, not sure what the question is. Note, this is a summary of my workflow, as it has evolved during the last 15-20 years. Decide on a decent file name, anything, like Birthday or London or Boat or whatever. Regardless of what I scan the scanner always places them in the same folder. When this work is completed I move the photos over to their correct folder. Here they stay and PSU is used to enhance and present. Some day they may be published in an album (on my photo server) or printed (in a document). A third major source is scanned film which is quite a separate topic. These days I record the date of scans in the file name only, using fillers for unknowns - so 199ymmdd or (if the decade is uncertain) c1990mmdd. All scans are also labelled with "scanned from slide" "scanned from print" or "scanned from negative", and if there is an obvious season, then a label for "winter", "summer" etc.